Photos from Collective Show Cruise! Finally arrived! Take a look at COLLECTIVE SHOW’s special exhibition for School Nite, an event held in conjunction with the New Museum’s Festival of Ideas. Collective Show Cruise comprised six artist groups from international metropoles, including LIMAZULU (London), Human Resources (Los Angeles), Reading Group No. 1 (New York), DeltaKame (Berlin), GIBSMIR Family (Zurich) and Silvershed (New York/Los Angeles). The two-day showcase featured contributions from Veronika Spierenburg, Urs-August Steiner, Dawn Kasper, Patrick Meagher, Rose Marcus, Yunhee Min, David Schafer, Zain Burgess, Ben Vickers, Tom Grimsey, Kazimir Lee Iskander, Ed Lehan, Huw Lemmey, Mike Oswell, Samara Scott, Timur Si-Qin, Kari Altmann, Charles Broskoski, Lindsay Lawson, Billy Rennekamp, Maxwell Simmer, and Harm Van Den Dorpel. Published on 22 May ’11 12:03 pm. The collaborative poster project will be showcasing its latest edition at Silvershed this Sunday, May 15! Featured at the Dependent Art Fair and at the 2010 NADA Art Fair, 2-UP pairs two members together to produce a double-sided poster that is packaged in twos. Each poster’s theme and content is a complete creation of the participants involved. Published on 11 May ’11 3:48 pm. Perhaps New York’s most collective-friendly locale for art-viewing during Armory Week 2011 is this one night event. To be held in a hotel room not far from its inversely titled art fair, the Dependent Art Fair will exhibit sixteen various artist groups and gallery spaces. 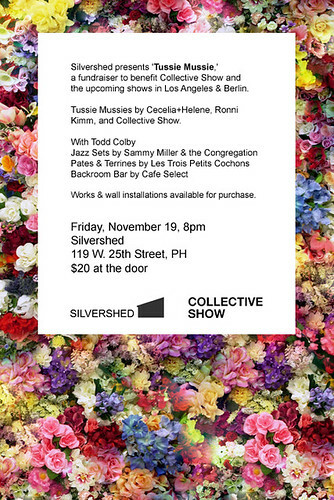 Silvershed, organizers of Collective Show, is one of the groups exhibited so be sure to come by on Friday to experience this gem of a show. And join us at the Silvershed immediately following for the afterparty! Published on 3 Mar ’11 1:48 am. New Kunstverein NY publications at Printed Matter! The New York chapter of the international curatorial office and Collective Show group will debut two new editions at New York’s Printed Matter storefront this Thursday, February 24. The first, On View, Worldwide, for the Month Of… is an artist calendar produced in a collaborative effort. Published on 23 Feb ’11 4:44 pm. ‘Office Hours’ at Forever & Today, Inc. The latest exhibition at Forever & Today, Inc. is one that places the viewer in a space that is both singular and varied. Ian Pedigo’s transformation of Chinatown’s storefront alternative art space takes the notion of a small business office and, while applying it to the art curator’s workspace, exposes the inner workings of the curatorial process from its seams. Published on 16 Feb ’11 10:35 am. In conjunction with the launch of Dispatches and Directions, some of the most interesting artists and organizers in Los Angeles will engage each other in discussion on a variety of topics relevant to their work. Participants will include Dorit Cypis, Jennifer Doyle, Lauri Firstenberg, Eve Fowler, Piero Golia, Sarah Lehrer-Graiwer, Thomas Lawson, Giles Miller, Davida Nemeroff, Renaud Proch, and Wu Tsang. Published on 11 Jan ’11 5:37 pm. Charming, varietal, capricious, distinctive—all are descriptors of both the petite Victorian floral arrangement, as well as Collective Show’s New York evening and fundraiser. Presented by Silvershed, the event featured jazz music by Sammy Miller and the Congregation, an array of various patés by Les Trois Petits Cochons, and a backroom bar by Café Select. Allocating each wall to a different curatorial undertaking, the space presented three visual arrangements by Cecelia+Helene, Ronnie Kimm, and Collective Show itself. All of the works on display were available for purchase. Each of the individual Tussie Mussie contributions stood independently while also allowing for a collective viewing experience. Published on 1 Dec ’10 7:41 pm. On a balmy late summer evening, viewers packed in to Participant Inc.’s Houston St. gallery space for the opening reception of Collective Show New York. The crowd spilled out onto Houston St. and drew interest from wandering passersby. The walls were lined with an array of engaging pieces that often eschewed norms of viewer and audience participation as well as authorial attribution. The show featured hanging works, interactive sculptural assemblages, and performances that continued beyond the reception gathering. Published on 25 Sep ’10 7:39 pm. Collective Show New York at Participant Inc. Collective Show New York 2010 was an artist-organized exhibition of contemporary collaborative art groups recently established in New York. 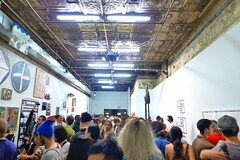 Thirty art groups exhibited their work in the September show at PARTICIPANT INC, a not-for-profit gallery in the Lower East Side of Manhattan. Artworks, posters and publications were on display. Screenings and performances also took place during the exhibition. Published on 24 Sep ’10 11:25 pm.